At Restore Behavioral Health, treatment interventions are designed to capitalize on the brain’s amazing and intricately complex capacity to change itself based on experience and feedback from the body and from the external environment. We know that the brain is the most sophisticated, and dynamically changing structure in the universe, with trillions of neuronal synaptic connections that shift, change, and strengthen based on feedback and use. Thanks to advances in the field of neurotechnology over the last few decades, we now have access to advanced tools that can be used to guide and stimulate further neuronal enrichment of these connections. This in turn translates into natural improvements in brain function. The brain is more than a chemical organ, and as such needs more than just a chemical approach to optimize function and well-being. RBH offers advanced clinical technology to help the brain become more adaptive and flexible in its neurophysiological funtioning. These interventions challenge the brain to shift its function, which serves to exercise and strengthen the brain’s connectivity between regions. The result is improved cognitive function, sleep//wake cycle, and mood regulation which allow the patient to achieve a higher level of emotional, cognitive, physiological, and behavioral functioning. The repetition of thousands of neurons simultaneously shifting their activity in order to meet the threshold requirements in Neurofeedback is akin to working the body out at the gym to strengthen and improve flexibility. Clinical research studies have found Neurofeedback to be as effective as medication for the treatment of ADHD. Many other behavioral health conditions have shown. significant improvement in response to this neuropsychological intervention, including depression. Anxiety., Autism, Learning Disabilities, TBI, and Substance Abuse. RBH offers QEEG- guided Neurofeedback to assist the brain in as more efficiently regulating its neurophysiological functioning. ral difficulties emerge from cortical functioning that is stuck in under or over-arousal. This significantly alters the functioning of the brain in the affected regions and disrupts efficient connectivity between regions. 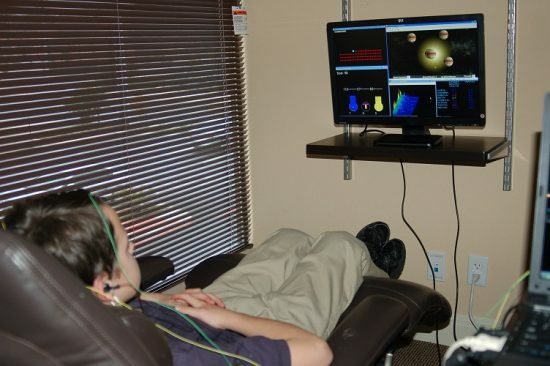 Neurofeedback offers the brain real time auditory and visual feedback regarding its own function, providing reinforcements to help the brain learn to shift its neuronal activity. This powerful method of training the brain utilizes the brain’s innate neuroplasticity, or ability to reorganize itself based on experience and feedback. It is as though the brain is looking at itself in a mirror and finally having a window through which it can begin to identify how to operate more efficiently. Many patients report significant improvements in attention/concentration, inhibitory/impulse control, mood regulation, stress and anxiety reduction, and healthy changes in physiological regulation (e.g. sleep/wake cycle, pain management). 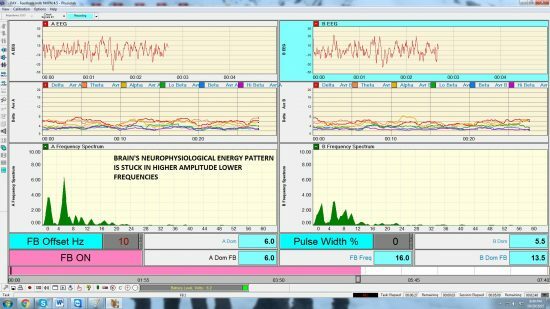 RBH additionally offers High Performance Neurofeedback, a new type of Neurofeedback that offers a tiny, imperceptible frequency offset signal based on the brain’s dominant frequency pattern. 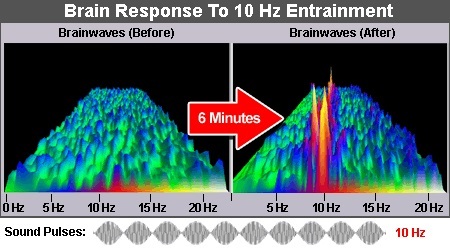 Normative function in a healthy brain is based on a peak frequency of approximately 10 Hz, with flexible energy distribution across multiple frequencies. Slowed Peak Frequency is associated with a number of neurocognitive inefficiencies whereas elevated fast wave activity can shift the Peak Frequency toward a state associated with high anxiety. When the brain gets stuck in any one frequency, its functioning is more rigid resulting in less than optimal function of the cortical regions involved. HPN provides a gentle challenge for the brain to reset itself and then to reorganize to a new level of homeostasis marked by a wider and more easily fluctuating distribution across frequencies. Many seeking Peak Performance as well as patients with Depression, Trauma, and TBI, including NFL players, have benefitted from this type of neurofeedback which is based on the research on Low Energy Neurofeedback. Cognitive function and emotional and behavioral regulation have improved significantly for many patients with this new technology. There is tremendous research taking place which is showing that the brain is benefitting from different types of stimulation in order to shift its function into a more flexible state of functioning. RBH offers to our patients the availability of the Alpha-Stim, which is a safe, well-researched CES device shown to have clinical benefits in the amelioration of symptoms of Anxiety and Insomnia. Ongoing research is additionally investigating benefits for depression and pain. RBH offers this self-regulation tool as a method of assisting to shift brain activity toward a state that helps to promote stress reduction. The Alpha-Stim provides a small frequency signal to the ear lobes which the brain detects and then is able to respond to with the increased production of Alpha brainwave activity. This Alpha pattern of activity has been associated with a general state of calm relaxation, improved sleep and mood, as well as decreased anxiety. Use of the Alpha-Stim has served to be a wonderful alternative or adjunct to other traditional therapies such as medication and therapy serves as a safe, healthy way of improving brain function. Photic and Auditory Brainwave Entrainment offers an innovative, non-invasvive neurotechnological tool to assist the brain in engaging in a variety of targeted frequencies of function. The brain has an amazing ability to mirror freq uencies and patterns that it detects in the environment. Improved attentional and cognitive functioning have been associated with healthy beta activity in the brain. Slowed brainwave activity has been associated with ADHD, Depression, and Learning Difficulties. With brainwave entrainment technology, sounds and lights are presented to the brain in a pattern of identifiable frequencies that allow the brain to shift into a parallel mode of neuronal firing. Repetition of this pattern helps the brain to improve its neuronal functioning. Entraining the brain’s activity to an alpha or theta bandwidth of activity is associated with a deep state of relaxation and creative insight, while entrainment to a beta frequency has been associated with improved attention and learning. Delta brainwave entrainment can assist with sleep induction, and alpha entrainment assists in generating a calm state of relaxed readiness. This safe, non-invasive technology is a powerful way of guiding the brain toward strengthening different states of function. 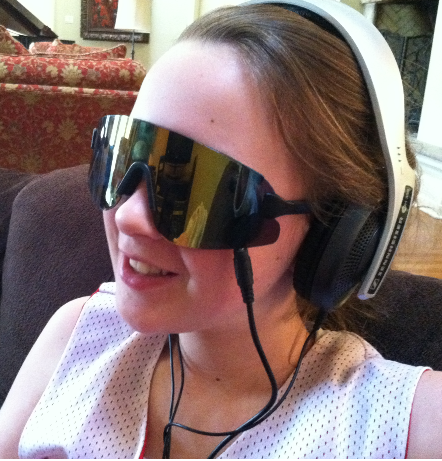 Auditory and Photic Brainwave entrainment is helpful for all ages and can be an important part of any natural treatment program designed to improve brain function. Another new natural technology for assisting the brain with improved functioning is Transcranial Near Infrared Light (NIR) Therapy. NIR Low Level Light Therapy has been found to improve blood flow to the brain and body by activating cellular metabolism for improved circulation. This has been shown in clinical research studies to improve blood perfusion of cortical tissue resulting in higher blood oxygenation levels. This treatment has been associated with higher levels of executive function when applied to prefrontal cortex regions. Improved blood flow, increasing the flow of nutrients and resources. Cellular regenerationis stimulated – faster healing and less chance of scars. 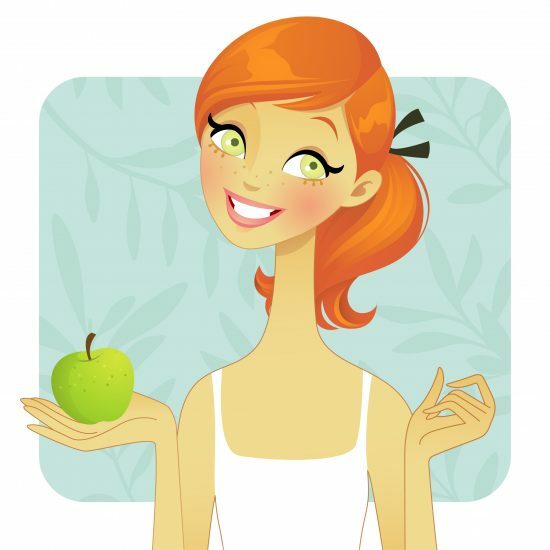 Clinical Research studies have shown that we can use our minds to actually shift our brain function. Many expert meditators, such as Tibetan monks, have been able to achieve deep states of relaxation, creativity, pain tolerance, and calm associated with increased alpha, gamma, and theta brainwave activity through improving their mind’s ability to focus and shift attention. RBH offers Mindfulness Training to those seeking not only to reduce overall levels of stress and anxiety, but also to assist in building the mind’s ability to control brain states. Mindfulness training helps to quiet the mind and cultivate powers of concentration, often allowing the mind to attend to the “here and now” and present state of body, mind, and brain function. There are many things we can do to improve brain function. RBH offers psychoeducational services to assist patients in making Brain Healthy Lifestyle Choices. We know that our lifestyle can have a significant impact on brain function. Nutrition, Hydration, Sleep, Stress Management, Exercise, Passion and Purpose, and Body Health all impact brain function. RBH offers supplement and dietary recommendations, strategies for effective stress management, and recommendations for exercise and cognitive/social activities which can assist in improving brain function at any age. Maintaining healthy brain and body functioning is essential for meeting cognitive, emotional, behavioral and relational goals.